There are no major economic reports in Japan but Crude Oil Inventories, Natural Gas Storage, Business Inventories m/m, Unemployment Claims, Import Prices m/m, Philly Fed Manufacturing Index, Empire State Manufacturing Index, Retail Sales m/m and Core Retail Sales m/m will be released in the US. 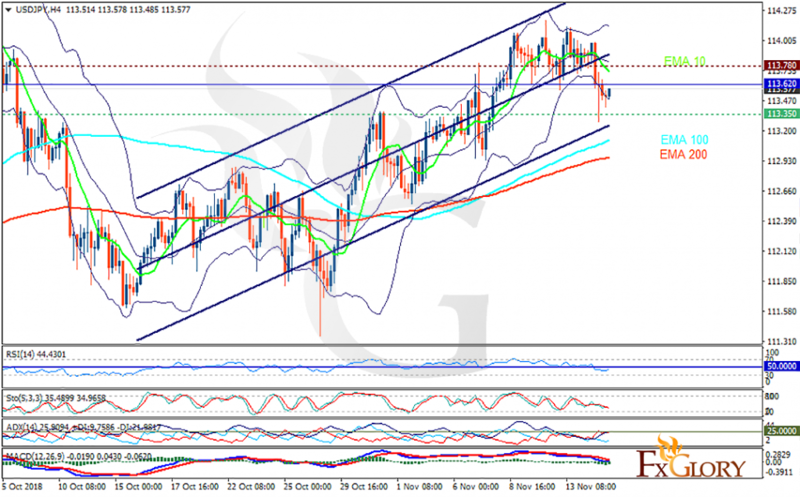 The support rests at 113.350 with resistance at 113.780 which the weekly pivot point at 113.620 is located in between the lines. The EMA of 10 is moving with bearish bias in the descendant channel and it is above the EMA of 100 and the EMA of 200. The RSI is rising towards the 50 level, the Stochastic is moving in low ranges and the MACD line is below the signal line in the negative territory. The ADX is showing sell signal. The price has already reached the lower Bollinger band and now it’s time to grow towards 114.2.